Wall-to-wall cameras of all sizes and varieties and media filled part of the Sycamore Building's third floor the morning of May 25. The scene was something reminiscent of a stop on "The Beatles" tour, yet the commotion was over different celebrities - who squawked more than sang. "I saw them yesterday," said building manager Gloria Jackson, swapping stories of falcon sightings. "I was on the 11th floor, and this huge thing appeared in the window," she said, extending her arms to demonstrate the size. John Castrale, a retired nongame biologist for the Indiana Department of Natural Resources and Allisyn Gillet, a DNR nongame biologist, collected the falcon chicks from the graveled roof of the Sycamore Building and carried them down to the third floor for banding and a blood sample. The nest on top of the 12-story Sycamore Building was the first successful effort since the relocation of the pair from their old home, Indiana State University's Statesman Towers were demolished in 2015. The pair attempted to start a family last year prior to the nest box being built, but the eggs rolled off because of the slope of the ledge. Castrale and Gillett entered the room with what unorthodox bird-collecting gear to the non-DNR eye: two green pool nets, a bucket and an empty pale of cat litter. "We learn a lot by these simple bands," said Castrale, showing the crowd the silver identification band from the federal Bird Banding Lab and the blue DNR band. "It's kind of low-tech, but we learn a whole bunch about their longevity, their survival rates, their dispersal rates .... We take a blood sample so we can look at genetics." Castrale has identified more than 600 peregrines in his 26-year career and retired two years ago. This is his seventh site visit so far this year. In Indiana, there are currently about 20 falcon territories, 14 of which include nests with eggs. 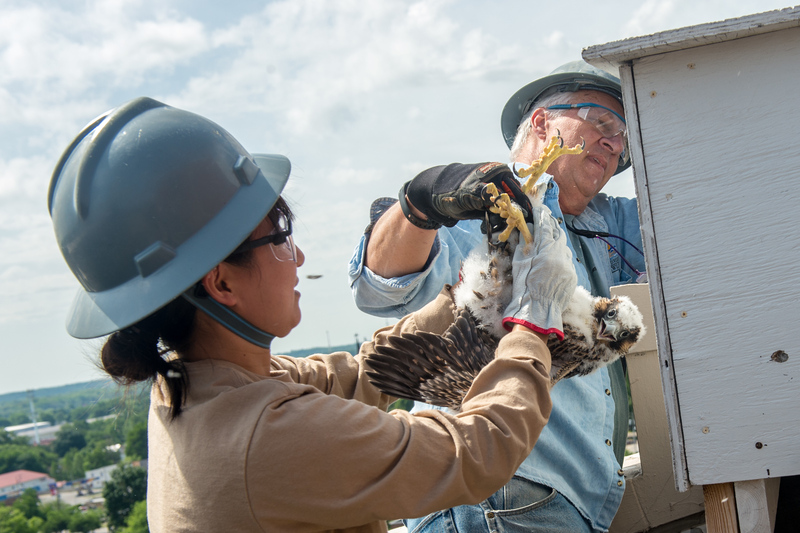 The population is a part of the best large-scale restoration effort for peregrine falcons, coordinated by the Midwest Peregrine Society at the University of Minnesota in St. Paul. Castrale and Gillet monitor nest sites and note how many chicks are produced. The Midwest falcon population boasts more than 300 pairs, with many of them settled along the Great Lakes. However, said Castrale, the falcons have adapted to urban and industrial settings, with their own idea of a comfortable nest. "In Indiana, a lot of these nests are on a building, on a smokestack or under a bridge," Castrale said. "They use just a ledge, and they get some debris or some gravel, that's what they like. We will fill nest-boxes with pea gravel. It's an ideal situation and very attractive to these birds." Falcons do not make good neighbors and do not welcome any competition within a six-mile radius. Peregrine falcon eggs have an 80 percent hatch rate, with four eggs being the average per nest and 2.5 baby falcons raised on average each year. Only half of baby peregrine falcons will survive their first year, but once that milestone is reached, survival jumps to 80 percent per year. "Falcons as old as 19 have nested, but after 14 they're usually too old to lay fertile eggs," Castrale said. Falcons can nest at one year, but usually wait until they are three years old to be fit to challenge the owners of occupied nests. The fluffy-white falcon chicks and their parents are bird-eating raptors. They diverse diets, eating anything from a small duck to a seagull. Unfortunately for Terre Haute, Castrale said, they may chase crows, but will rarely kill them because they are too big. They are strictly aerial predators, he said. Banding the chicks do not cause the parents to abandon them, said Castrale. "That is an old wives' tale that needs to die," Castrale said. "Birds have a poor sense of smell, each pair of parents is different as far as personality." Other than for banding, they check the nest boxes once a year to clean feathers from the nests - for the birds' comfort and to collect specimens for dietary research. "They got a little closer than normal," said Castrale of the parents. The mother circled overhead, and both parents shrieked as Castrale and Gillet returned to the conference room with a fluff-filled bucket. This nest had a 75 percent hatch rate - two males and a large female - from four eggs. Anywhere from six weeks to two months after hatching, these chicks could take flight and become independent predators. The sister bird shrieked unhappily while she was being held up. "She can see the lights in the room flicker," said Castrale, and all the humans looked up at the lights, trying to see any difference. The bird's 15 minutes of fame wrapped up with a group picture of the three baby falcons. The nest on top of the 12-story Sycamore Building was the first successful effort since the relocation of the pair from their old home, Indiana State's Statesman Towers were demolished in 2015.